Late last year, Rina and I were supposed to attend a lunch at Mesclun with my other blogger friends.. As luck would have it, we had already committed to other plans, so we were unable to join the event. Though I had a wonderful time during my own trip, seeing the posts of my other blogger friends made me extremely jealous. Everything looked absolutely amazing. I intended to bring Rina there one time, but our schedule didn't permit it, until it was eventually forgotten about. 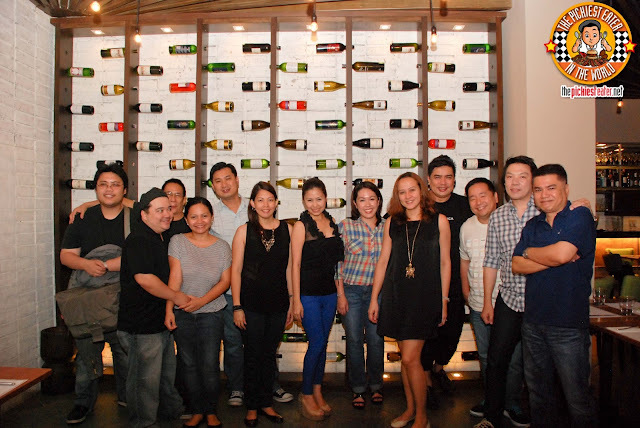 When I found out that Mesclun Bistro would be opening in Serendra, It once again re-awakened my longing to visit. This time, luck was on my side, because my and some blogger friends were once again invited to try some items of their menu, I cleared my schedule and made sure Rina and I wouldn't miss it for the world! 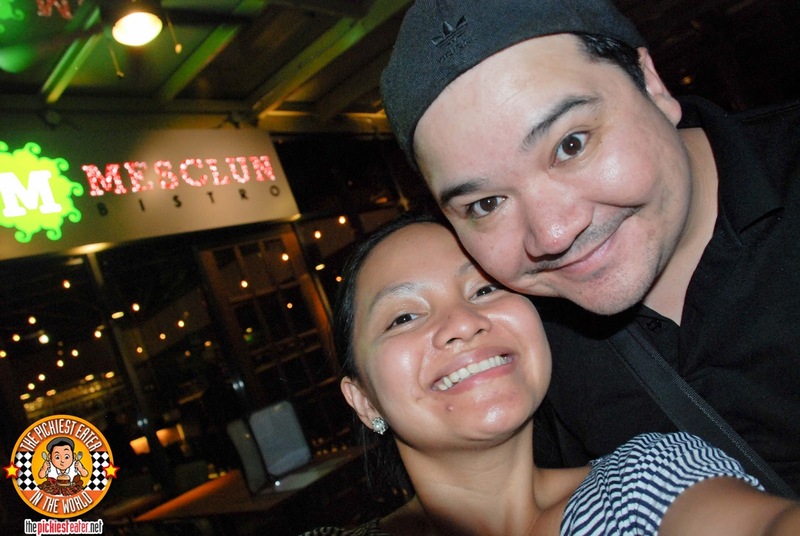 I am a fan of Chef Katrina Kuhn-Alcantara's work at Chuck's Deli. It takes a special kind of person to understand that a SLABwich is more appealing than a sandwich.. well for ME at least hehe. With Mesclun Bistro, Chef Katrina has a venue to show off her culinary finesse and techniques, without losing the playfulness that makes Chuck's Deli so much fun to eat at. Not very many people pay attention to the dinner rolls to start off the meal. Perhaps they feel that their stomach space should be saved for the actual meal. Fortunately for me, I have enough stomach space to go around. (I'm not sure if that's something I should be proud of though). Mesclun Bistro doesn't outsource their bread.. Everything is made in-house. (They're a sister company of Chuck's Deli, remember?) 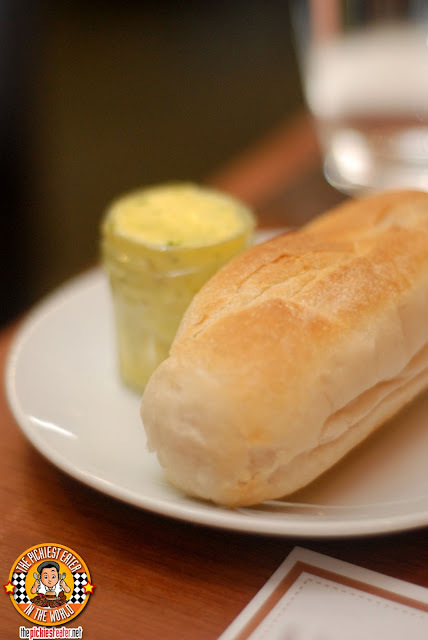 The exterior of the Mini Baguette had a wonderful crunch, and gave way to a steaming hot inside, in which the butter just sunk into within seconds of contact. 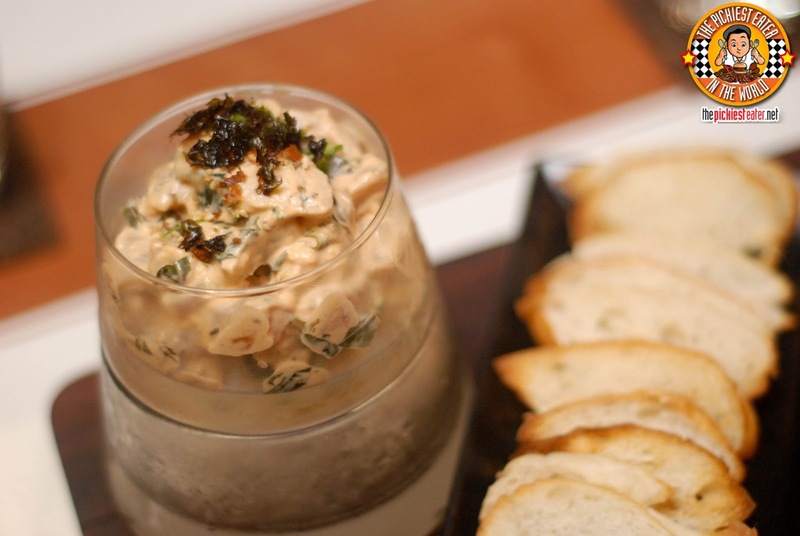 The first appetizer they brought out was the Escargot (P345). How much would it surprise you if I told you I didn't try this. As I'm sure you know, Escargot is made with snails. Snails are something I don't eat. Even when we were in New York at a restaurant Anthony Bourdain was raving about, in which one of their specialty dishes was snails, I didn't even bother. But to say Rina "loved" it, would be an understatement. 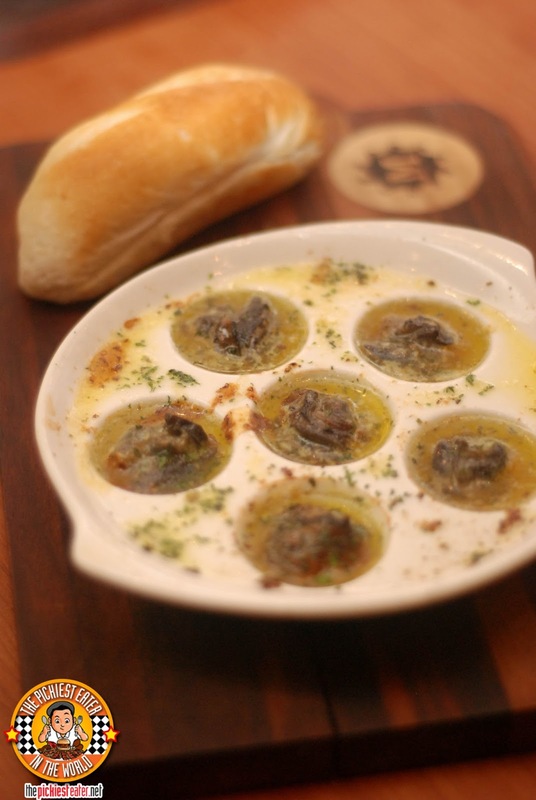 The snails are baked in a Parsley butter, and served still hot. Even SHE was surprised with how much she loved it and raved about the butter sauce. Wondering what all the fuss was about, I tore off a piece of the baguette and dipped it into the small pools of butter that was on the escargot platter. And yes, it was phenomenal. 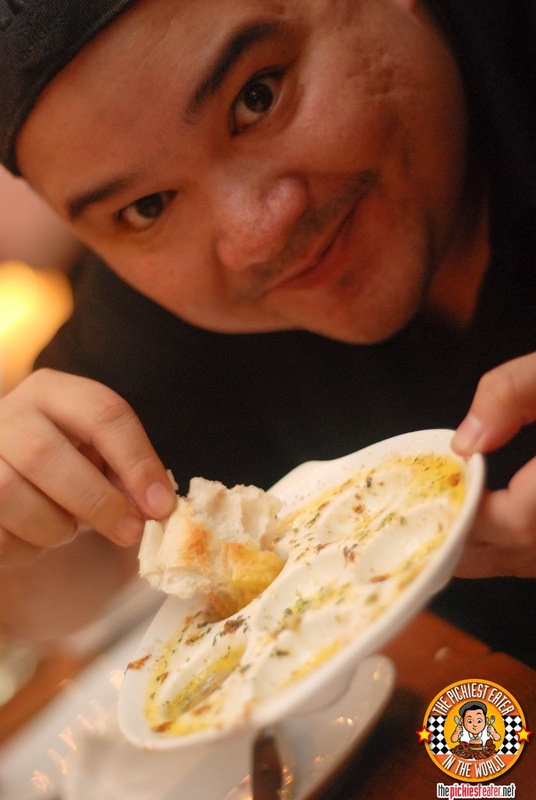 Another thing that was an immediate hit with the other bloggers was "Andre's Poke" (P345). As a picky eater, I don't eat raw stuff, so I again skipped this.. Which was fine with the others because it meant more for them. Rina liked the tuna ceviche which was bathed in a soy sesame dressing and slathered with Sriracha Mayo. The fish is best enjoyed when smothered upon a crisp crostini. My dearest friend, "Food Reviews Manila" brought the house down when she proudly declared, "I couldn't stop eating the Poke!". When Mesclun Bistro's Sourdough Pizza with Anchovies (P295) was laid out in front of me, the first thing I thought of was picking out the anchovies. 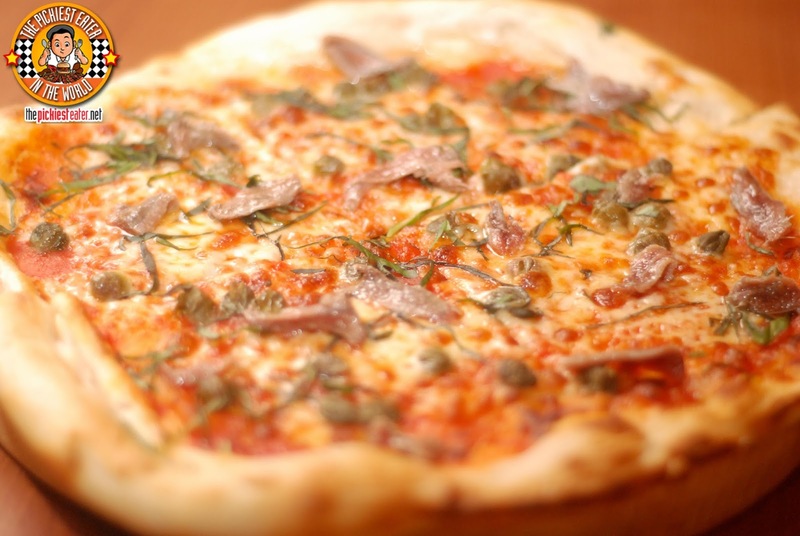 Again, being a picky eater, I'm not a big fan of Anchovies, so I was positive I wouldn't be too fond of a pizza when its the featured protein. I was pleasantly surprised when I discovered that this was actually quite good. The beauty of the pizza, was in the combination of everything that worked together beautifully. The sourdough crust, the acid on the tomato against the creamy cheese, and the sharp saltiness of the Anchovies just worked. I could have done without the capers though.. Another ingredient i'm not too fond of. hehe.. But again, this was a tomato based pizza.. So my poor Hyper-acidic self could only eat a couple of bites from Rina. Not eating too much of the pizza worked out fine, because it meant I had more room in my tummy for Mesclun Bistro's "Flammekeuche".. Which is a Flat bread Pizza with added Ooomph. These pizzas seemed like they were made exactly for me. Imagine, eschewing the normal red pizza sauce for a creme fraiche (which, by the way, is made in house) base spread out on the crispy baked flatbread. 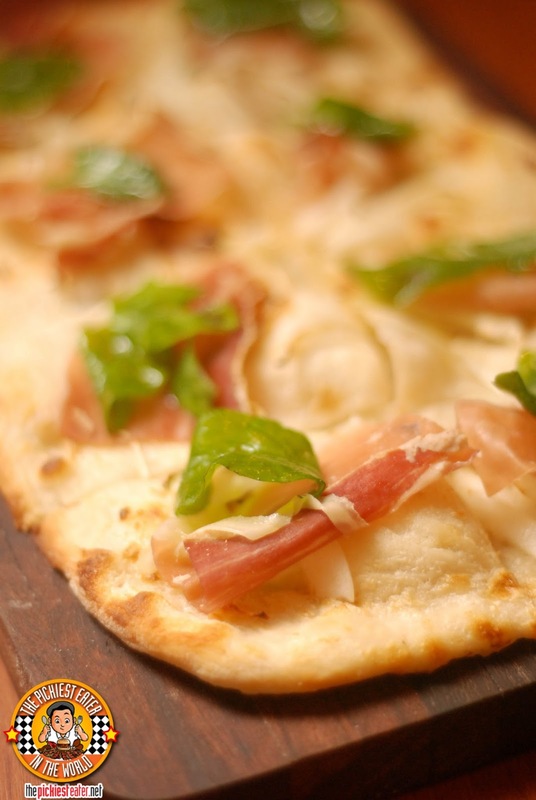 The first variant we tried, was called Speck (P295) and consisted of flavorful Prosciutto, topped off with arugula, with a touch of lemon oil for a lemony twist. Deeeelicious! If I were to choose one dish from the night that I wish I could have had seconds and third servings of, it would definitely have been the Sausage Flammekeuche (P295). Again, the pizza had a creme fraiche base, topped off with a mix of crumbled English and Italian Garlic Sausages, and onions. 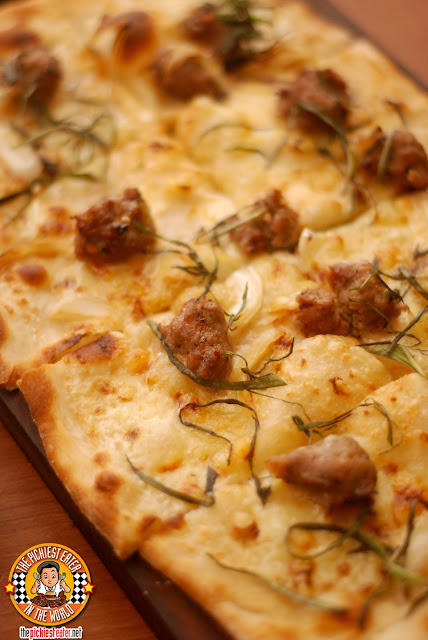 I believe it was the Italian sausage that offered just the right amount of heat to tickle your taste buds, and making the thought of eating only one slice an impossibility. 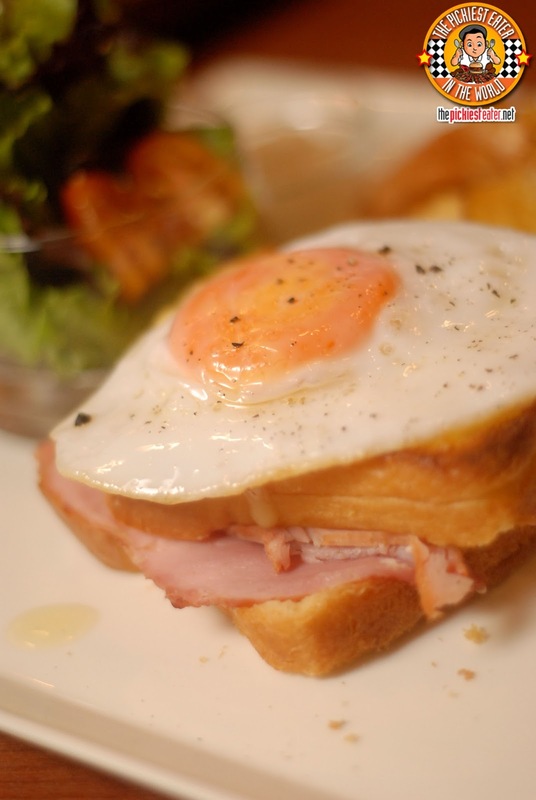 I love a good Croque Madame (It's a fried sandwich, so what did you expect?). Unfortunately, prior to this night, I hadn't had one in ages. And boy did it come back into my life with a resounding BANG in the form of Mesclun Bistro's Croque MaDuck (P335)! A gorgeous slice of French Ham, sandwiched between with a rich bechamel sauce, and gruyere-emmenthal gratin, and for a little twist, topped off with sunny side duck egg. From the light smokiness of the ham, and the mix of the creamy bechamel with the sharpness of the cheeses, this was one mind-blowingly good sandwich. I was also happy that the dish had a side of house-made Potato Chips, not unlike what I've enjoyed in Chuck's Deli in the past. I normally don't eat Foie Gras, but it was pretty hard to say no to the Foie Gras Baguette Sandwich (P1,395.00). Easily one of the most expensive sandwiches I've ever had, it's also easily one of the most delicious. 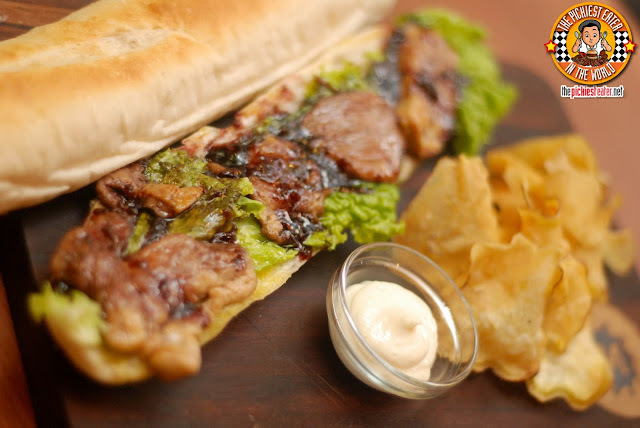 The sandwich is comprised of pan seared chunks of fatty duck liver, laid out on a freshly baked baguette, and slathered with a raspberry-infused Port wine reduction. As a fan of "Sweet & Savory" food, this sandwich single-handedly made me change my mind about Foie Gras. Something my sister always tells me whenever I tell her I'm not too fond of foie gras is, "How can you not be? It's like eating pure fat!". Isn't how funny in my family, eating pure fat is a good thing? The foie gras is definitely rich, and decadent, but the sweetness of the raspberry offers a nice counter punch to the flavors that prevent it from becoming too cloying. I've heard fellow food bloggers and friends rave about it, but I had never got a chance to try it myself. Known as one of Mesclun Bistro's signature dishes, the Sisig Spaghetti (P245). 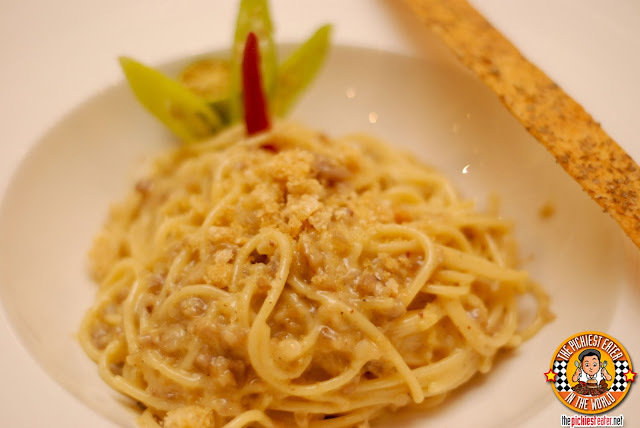 Spaghetti noodles coated in a rich cream sauce, with the unmistakable flavor of sisig very prominent. The noodles are topped off with Chicharon to give the dish added texture, and just enough heat from abit of chili that will tickle your taste buds. 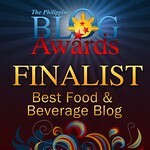 The final entree brought to us, was the House Cured Corned Beef (P595). 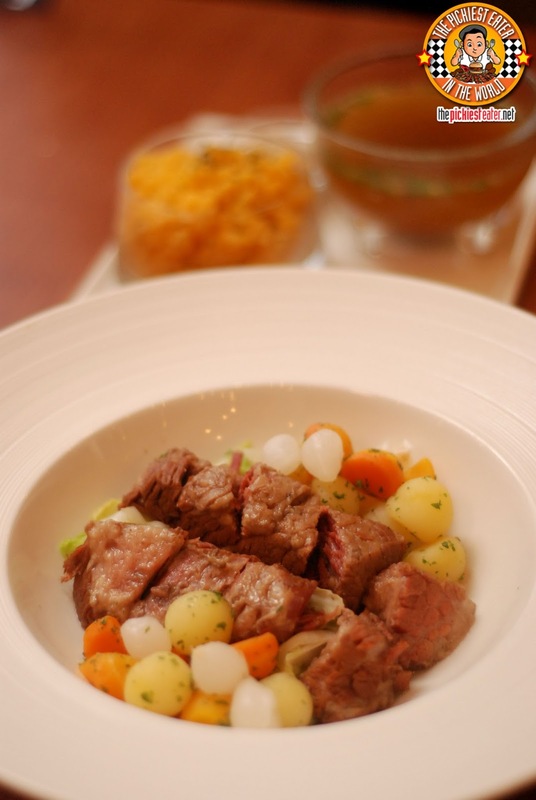 This was a chunk of very tender and juicy Corned Beef Brisket served with a medley of marbled vegetables. 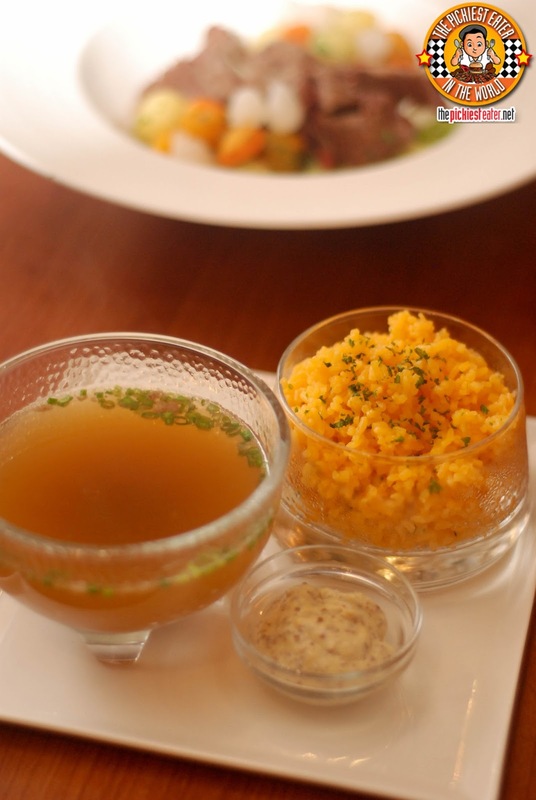 The dish comes with Horse Radish Sauce, rice and a broth that makes for some sort of a deconstructed "Nilaga". This was actually quite delicious, but I preferred the Corned Beef sans sauce, and with little spoonfuls of broth poured unto my rice. On the whole, everything I had was absolutely excellent. 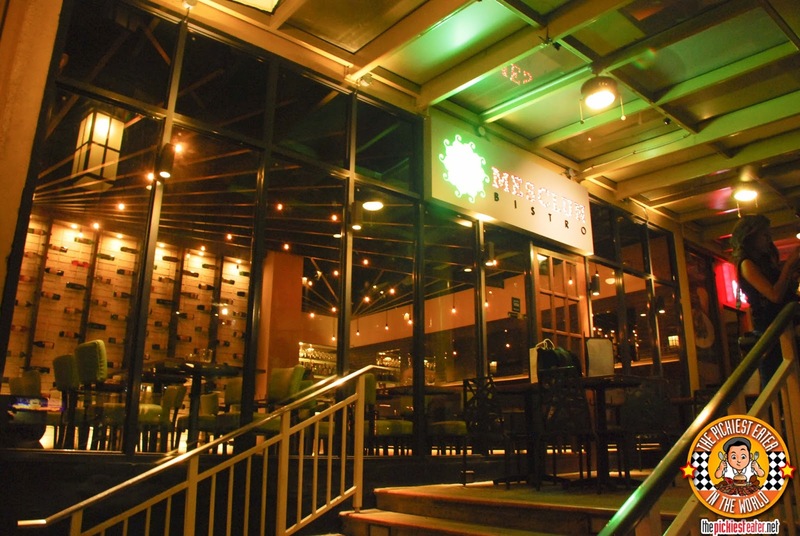 I loved the ambiance of Mesclun Bistro. It's snazzy enough for me to take Rina out to a romantic date, yet relaxed enough for us not to feel that we need to go there in a Barong and Baro't Saya. 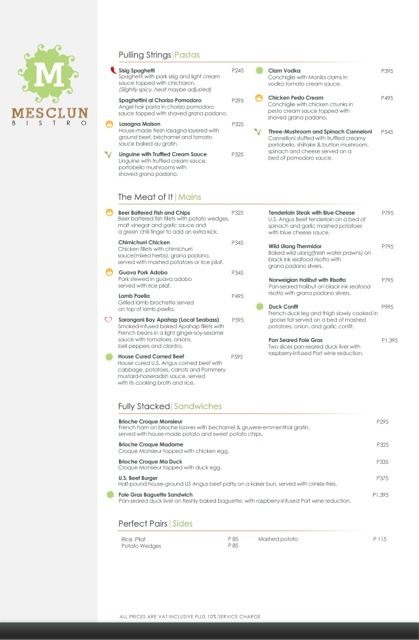 I'm very intrigued by the rest of their menu, and would love to explore it more.. Not to mention I don't feel that my life would ever be complete without trying the Bacon Flammekeuche. 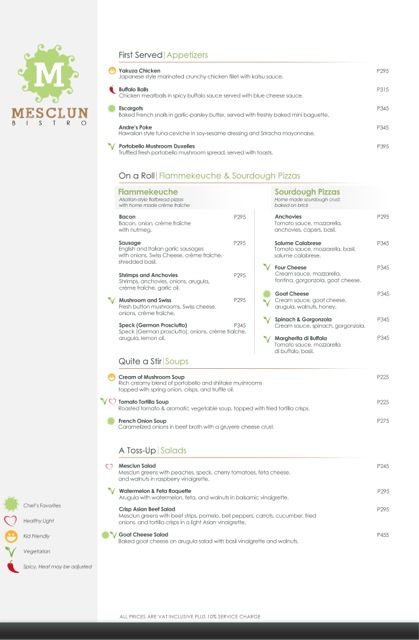 I've heard awesome stuff about Mesclun. Your photos are amazing. Must definitely try this next time I'm in Serendra.